According to the website this is a mild, makeup-removing cleanser suited to dry, combination or sensitive skin. It is a gentle, preservative-free cleansing oil that will rinse skin of even the heaviest makeup in addition to imparting bountiful anti-oxidant benefits. The skin is left thoroughly purified, softened and refreshed. How to apply the product? Pour a couple of drops into your clean, damp hands and mix it with several drops of water to form a milky emulsion. Massage over face and neck and then rinse. Persea Gratissima (Avocado) Oil, Prunus Amygdalus Dulcis (Sweet Almond) Oil, Macadamia Ternifolia Seed Oil, Oryza Sativa (Rice) Bran Oil, C12-13 Pareth-3, Tocopherol, Glycine Soja (Soybean) Oil, Bisabolol, Lavandula Angustifolia (Lavender) Oil, Ormenis Multicaulis Oil, Chamomilla Recutita (Matricaria) Flower Oil, Daucus Carota Sativa (Carrot) Root Extract, Carum Petroselinum (Parsley) Seed Oil, Beta-Carotene, Linalool. Contains nut oils. 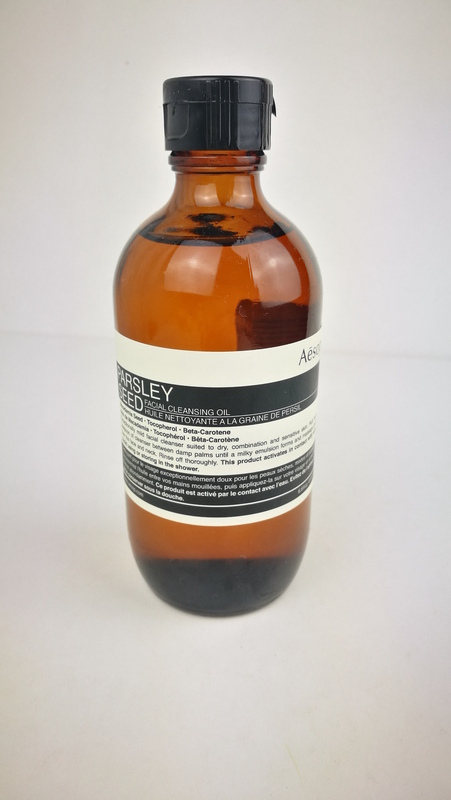 The Parsley Seed Facial Cleansing Oil has a nutty aroma and lets your skin feel supple, softened and hydrated. I use it every night and it removes all of my makeup. I am not wearing heavy leayers of makeup. Usually I wear a tinted moisturizer, bronzing powder, mascara and lipstick. The only negative thing I can say about this cleanser is that it stains the sink after every use. Somehow it leaves a very weird and oily residue. So after every use I have to wipe the sink. As I have my cleansing tools right below the sink this is an easy thing to do. And in the end its totally worth it, as I really love the way the Parsley Seed Facial Oil leaves my skin. This is a gentle, everyday toner suited to all skin types, including sensitive. Yay, as my skin is quiet sensitive I was happy to read that. It is a gentle skin-balancing blend, named for its inclusion of Provitamin B5 (a form of Panthenol) and Green Tea extract. The toner offers light hydration and anti-oxidant protection. It leaves the pores refined while the skin is cleansed of any remaining grime and gently prepared for subsequent hydration. Use half a teaspoon of B & Tea Balancing Toner onto a cotton pad or directly into your hands, and pat onto skin. In order to make our world a better place I have stopped using cotton pads on a daily base. Thats why I love to use the toner directly in my hands. Aloe Barbadensis Leaf Juice, Water (Aqua), Polysorbate 80, Hamamelis Virginiana (Witch Hazel) Water, Sodium Gluconate, Sodium Lactate, Benzyl Alcohol, Phenoxyethanol, Sorbitol, Panthenol, Cananga Odorata Flower Oil, Disodium EDTA, Sodium Citrate, Benzoic Acid, Camellia Sinensis Leaf Extract, Benzalkonium Chloride, Dehydroacetic Acid, Ethylhexylglycerin, Linalool, Benzyl Benzoate, Geraniol, Farnesol, Benzyl Salicylate, Eugenol, d-Limonene. The B& Tea Balancing Toner has a floral and herbaceous aroma. 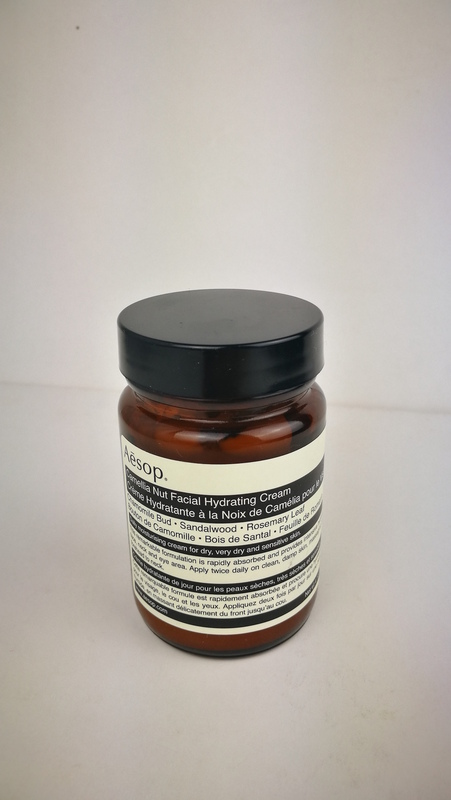 The texture is watery and it leaves the skin feel balanced and freshened. I am not sure if I will be repurchasing that particular toner. 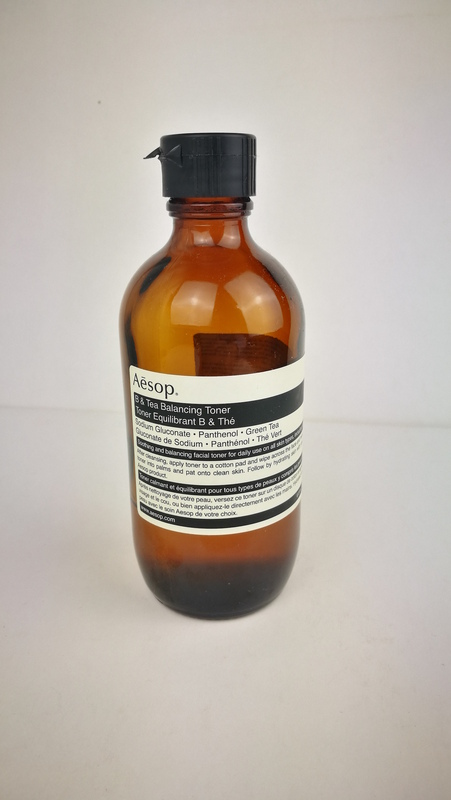 I might switch to an alcohol free Aesop toner because I have the feeling that this would be more suiting for me. Nevertheless I like to use this toner and am already half way through. So anyway it will be the product that I have to repurchase first. The Damascan Rose Facial Treatment is a precious and potent nourishing treatment for extremely dry or distressed skin. It is an exquisite treat not only for the skin but also for the senses, due to its wonderful rosy scent. This concentrated botanical oil is ideal for skin in need of intense, soothing hydration. 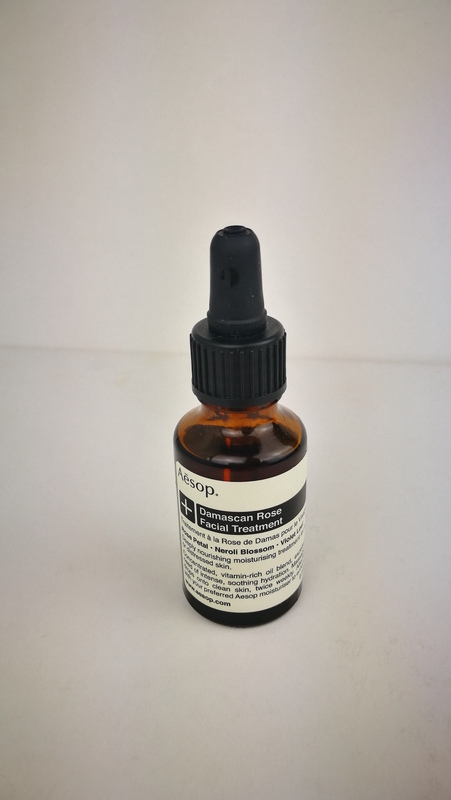 It consists of ten precious and potent plant extracts who deliver Vitamins E and A.
Massage three to five drops onto cleansed and toned skin from forehead to neck. What I love to do is to blend the oil with my hydrating cream. Some days I also use it by itself when I am in need of some extra hydration. Camellia Japonica Seed Oil, Oenothera Biennis (Evening Primrose) Oil, Prunus Amygdalus Dulcis (Sweet Almond) Oil, Rosa Canina Fruit Oil, Oryza Sativa (Rice) Bran Oil, Glycine Soja (Soybean) Oil, Tocopherol, Daucus Carota Sativa (Carrot) Seed Oil, Rosa Damascena Flower Oil, Citrus Aurantium Dulcis (Orange) Flower Oil, Viola Odorata Oil, Daucus Carota Sativa (Carrot) Root Extract, Beta-Carotene, Citronellol, Geraniol, Linalool, d-Limonene, Farnesol, Eugenol. Contains nut oils. The Damascan Rose Facial Treatment has a floral, earthy and slightly exotic aroma. The product texture is rich and oily. It leaves the skin feel hydrated, replenished and nourished. As I have already mentioned I love using this oily either by itself or mixed with my moisturizer. What I love about it is that the oil is being absorbed super fast. So on days where my skin feels extra dry I can even use the treatment during the day. Be sure to wear a high SPF, not only when wearing oily treatments. In spring and summer I am using a high SPF (30 or 50) and in fall and winter the SPF 25 that I have in my tinted moisturizer is enough for me. The Camelia Nut Facial Hydrating Cream is a nourishing daily moisturizer for dry or sensitive skin. 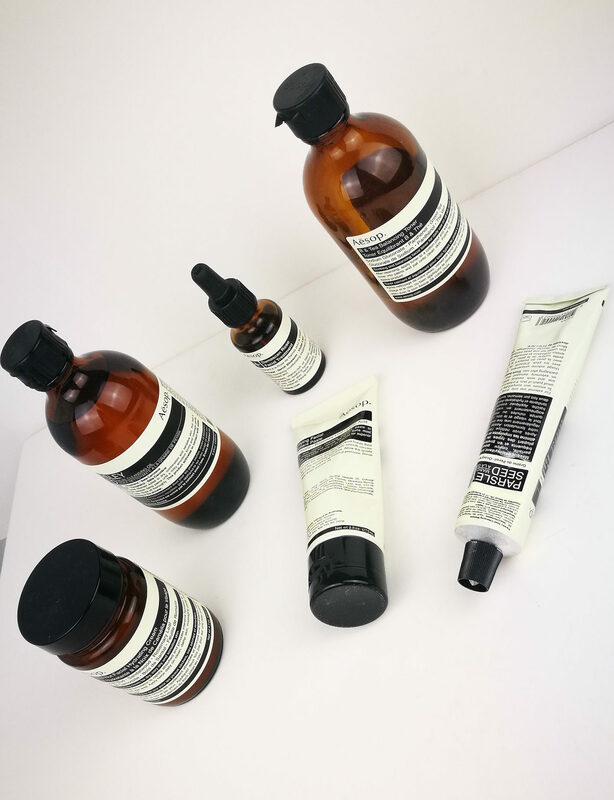 According to the AESOP website: the complex blend of nut and plant extracts in this extensively researched formulation absorbs swiftly. Providing anti-oxidant fortification and richly nourishing hydration without a weighty after-feel. Superbly emollient cold-pressed Macadamia Nut oil softens the skin, while Camellia Nut oil and Chamomile oil pacify irritation and patchiness. Massage into cleansed and toned skin. I personally dont like to massage creams. I rather pad and press the creams on to my skin. Massaging makes my skin red and since I am already dealing with a more pinkish complexion I want to make sure to avoid looking even more red. Water (Aqua), Glycerin, Stearic Acid, Cetearyl Alcohol, Aloe Barbadensis Leaf Juice, Camellia Japonica Seed Oil, Cocos Nucifera (Coconut) Oil, Macadamia Ternifolia Seed Oil, Rosa Canina Fruit Oil, Ceteareth-20, Glyceryl Stearate, Glycine Soja (Soybean) Oil, Tocopherol, Fusanus Spicatus Wood Oil, Theobroma Cacao (Cocoa) Seed Butter, Triticum Vulgare (Wheat) Germ Oil, Phenoxyethanol, Citrus Grandis (Grapefruit) Seed Extract, Lavandula Angustifolia (Lavender) Oil, Rosmarinus Officinalis (Rosemary) Leaf Oil, Ormenis Multicaulis Oil, Disodium EDTA, Sodium Citrate, Daucus Carota Sativa (Carrot) Root Extract, Beta-Carotene, Farnesol, Linalool, d-Limonene. Contains nut oils. The Camelia Nut Facial Hydrating Cream has a floral, nutty and woody aroma. It is a medium-weight cream that leaves the skin hydrated and matte. I am not sure whether I will be continuing to use this cream. I dont like the fact that it contains alcohol and want to check if they have one without alcohol that is good for dry to sensitive skin. Nevertheless I am using this cream day and night, and sometimes with a couple of drops of the Damascan Rose Oil. I am already more than half way thru. So after the toner this will be the next product to repurchase. So what I have found via the website is that it is a cream-based exfoliating formula suited to most skin types. Fine river-bed Quartz contained in a cream base performs exceptional exfoliation, sloughing away tired surface skin. Lactic Acid assists a mild, chemical exfoliation resulting in thoroughly purified, revived skin. Dispense a small amount into the palm of your hand and work the formula over the face and neck, including the lips. Avoid the immediate eye area. Allow the Quartz and Lactic Acid to gently exfoliate by employing minimal pressure. Rinse well with luke warm water and pat dry. Water (Aqua), Quartz, Glyceryl Stearate SE, Cetearyl Alcohol, Rosa Canina Fruit Oil, Ceteareth-20, Glycerin, Oenothera Biennis (Evening Primrose) Oil, Sodium Cocoyl Isethionate, Lactic Acid, Coconut Alcohol, Ormenis Multicaulis Oil, Phenoxyethanol, Sodium Hydroxide, Lavandula Angustifolia (Lavender) Oil, Rosmarinus Officinalis (Rosemary) Leaf Oil, Disodium EDTA, Methylchloroisothiazolinone, Methylisothiazolinone, Linalool, d-Limonene. The Purifying Facial Exfoliant Paste has an active, earthy lavender aroma. The skin feels polished, exfoliated and softened. I absolutely love this exfoliating paste. Eventhough I have very sensitive skin with couperose parts on my cheeks I enjoy using it. Of course I avoid the cheek areas and focus on my chin, forhead and nose. The cool thing is that this product is going to last for a while as you should only apply it once a week and need very little product. This is a wonderful product, I seriously love it. Its a clay-based masque to deeply cleanse and refresh your skin and it is suitable to all skin types. The blend of premium clays and botanicals lifts deep-seated impurities and refreshes the skin. 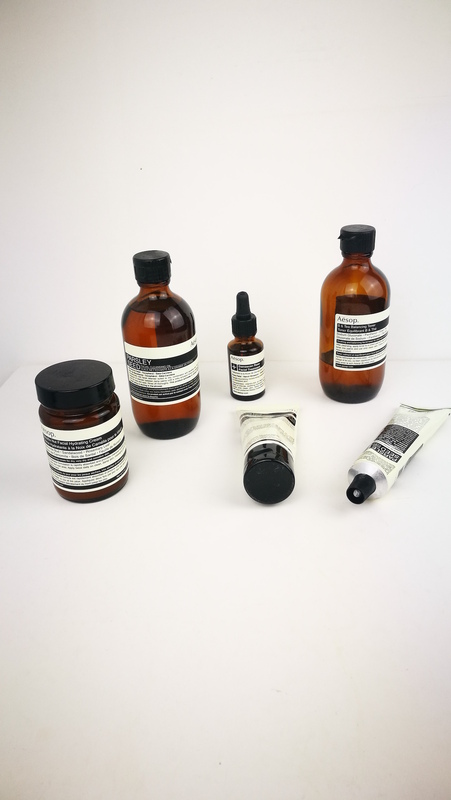 Parsley Seed extracts deliver potent anti-oxidants while other botanical elements cleanse and revive skin. Use after cleansing and apply a thin layer over skin, excluding eye and lip areas. Leave to dry for about fifteen minutes, or longer if time permits, and then rinse thoroughly with cool water and pat dry. Water (Aqua), Kaolin, Aloe Barbadensis Leaf Juice, Bentonite, Alcohol Denat., Glycerin, Lavandula Angustifolia (Lavender) Oil, Oenothera Biennis (Evening Primrose) Oil, Rosa Canina Fruit Oil, Phenoxyethanol, Ormenis Multicaulis Oil, Carum Petroselinum (Parsley) Seed Oil, Methylchloroisothiazolinone, Methylisothiazolinone, Linalool. 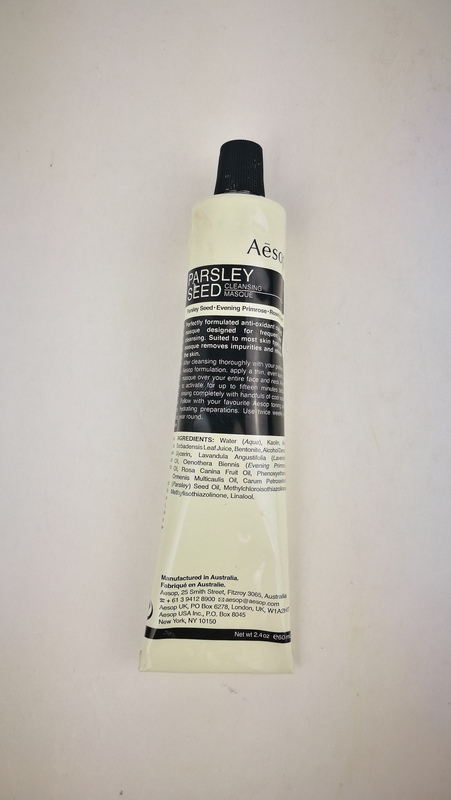 The Parsley Seed Cleansing Masque has a lavendery, herbaceous aroma. The texture is fine, and contains smooth Clay Oils. It leaves the skin deeply cleansed, softened and refreshed. 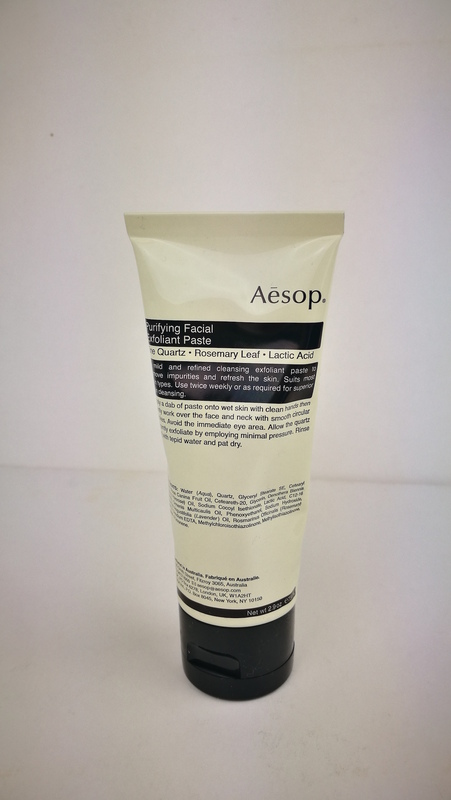 Out of all the AESOP products I really like this one the best. I can really see a difference in what it does to my skin. At the very moment I am dealing with impurities and regularely using this masque helps me a lot. The only thing that worries me a bit is that almost all their procucts contain alcohol. I was told that when you have sensitive skin you should avoid using products that contain alcohol. 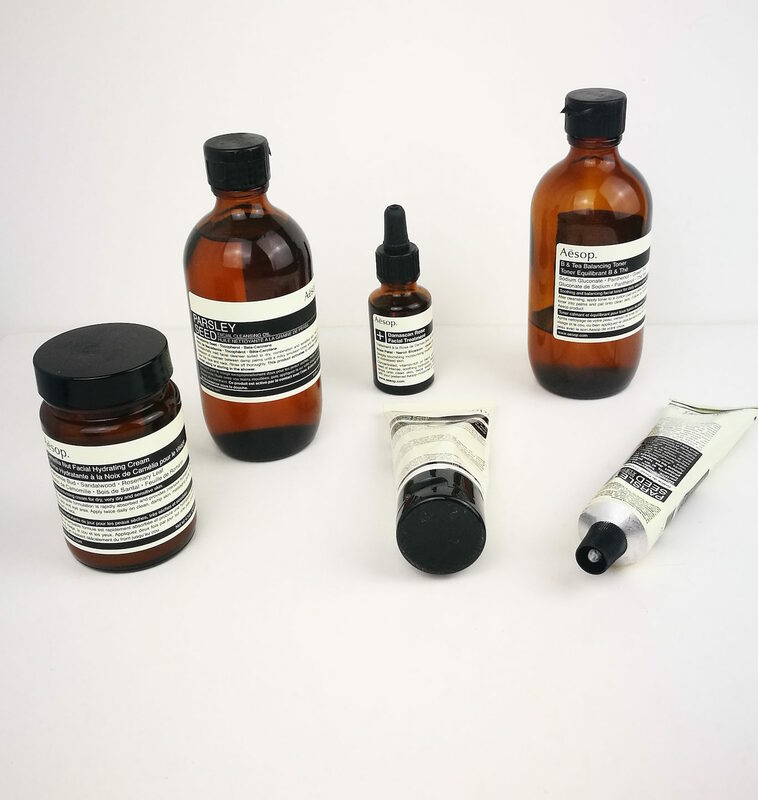 I would be curious to hear your opinion about alcohol content in skin care. Please comment below. 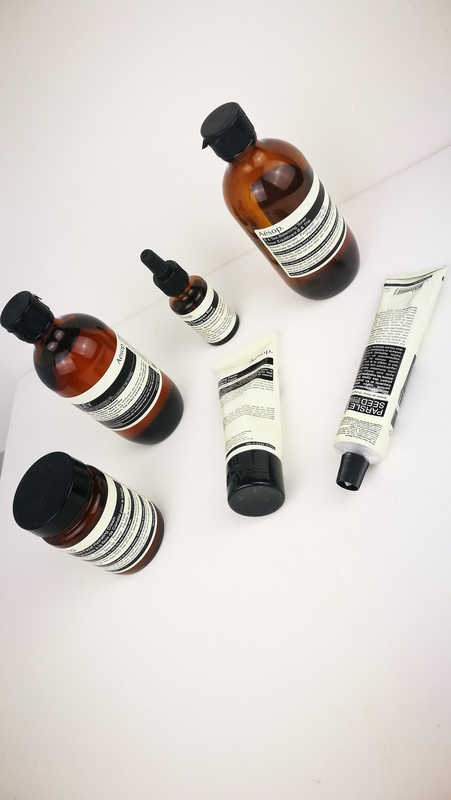 Also I would love to know which is your favorite AESOP product. Maybe there is something you can recommend that I have not tried yet.